How do you get the most out of a journal? The key is simple: write stuff down. Christopher Felton’s annual report consolidates a host of mundane journal records into fascinating summaries and visualizations. Some things are unpredictable: you’ll describe those in text. There’s no alternative. Nobody could have expected that to happen, and so you’ll have to start from the beginning. You have a specific place to put a specific bit of information, making it easier to find later. The type of the slot can remind you what sort of information you intend to record. Do you want a single name, or a list? Do you to record how far you jogged, or just whether or not you had your workout? 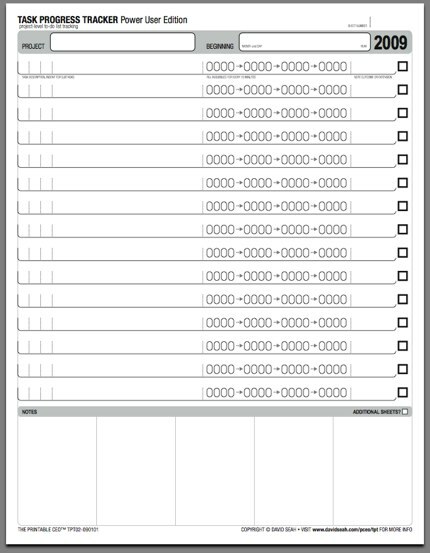 David Seah’s Printable CEO provides a variety of elegantly-designed paper forms for project planning. The disadvantage of a long list of slots is tedium: confronted with a long and complicated form, you may find yourself too busy to fill out anything. This is especially onerous if some of the things you once thought might be useful you now know to be worthless. And, once you find yourself questioning whether or not parts of the form are worth filling out, the entire project can seem tarnished and tedious. 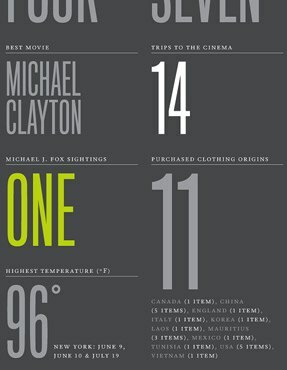 Still, without consistent records, Christopher Felton’s wonderful annual reports would never be possible. And, while you might overzealously set out to record everything you can imagine, there are bound to be some core elements you really want to track. 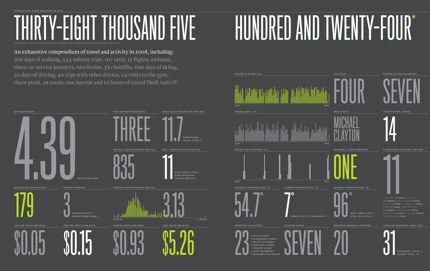 Kevin Kelly’s intriguing site on The Quantified Self gives a number of interesting examples. There’s also a Quantified Self Wiki. This tension gives rise to a host of systems, templates, and forms that you can find in stationers and on the Web. 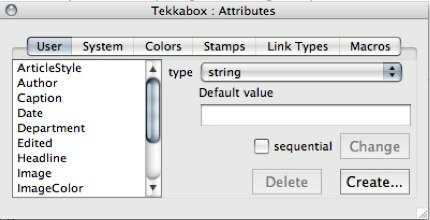 In Tinderbox , you can add metadata slot — Tinderbox calls this a Key Attribute, at the top of any text window by selecting any attribute from the key attributes menu or dragging it from the Attributes palette. You can make new attributes as well in the User tab of the Attributes palette. 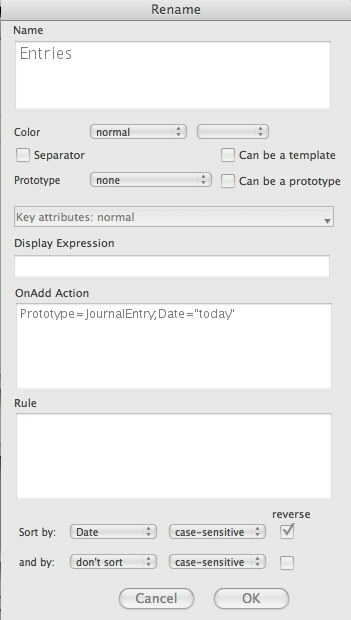 Most often, you’ll set the key attributes of a Prototype note, and let individual notes inherit those attributes. Hint: you might have special key attributes for special days. 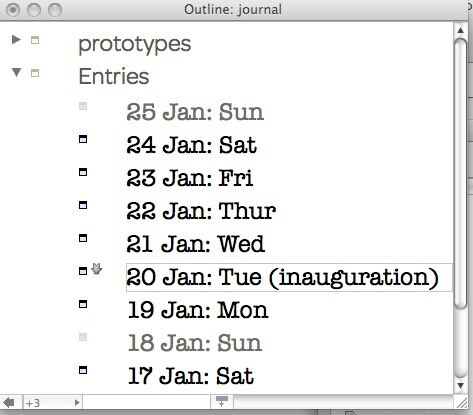 You might, for example, want to record some information once a week, not every day; an easy way to do this is to arrange for every Saturday’s note to inherit from a special SaturdayPrototype. 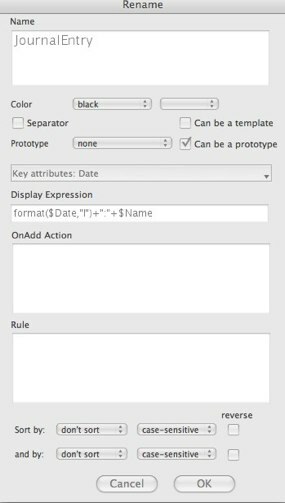 Create new User Attributes by pressing Create… the attribute palette. Others might better be simple checkboxes, or dates. 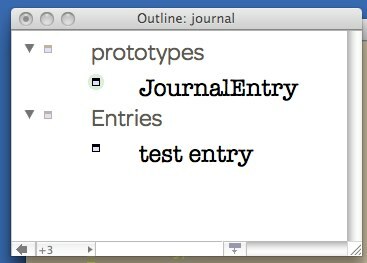 Sometimes, you'll want sets — lists of items, separated by semicolons. In planning a fresh Tinderbox , consider which kinds of metadata you are certain to need for each entry. Avoid the temptation to overload your system with dozens of slots, keeping in mind that, if you can always put information in the text of the journal entry and, later, formalize that information as a key attribute if it does prove useful to ensure its regular collection. What do you track in your Tinderbox journal? This exemplifies a typical Tinderbox trade-off: we’ve had to so some work to set things up the way we want, but we gain lots of flexibility. We can preprint more information. We can format the date however we like. Yes, we could do this with some sort of Preferences dialog, but then we’d have another kind of complexity. Note, too, that we don’t need to plan on doing this before we start keeping a journal. We could do without the date: it's nice to have, but we probably could manage without it. We could just write it out by hand: Pepys did! It doesn't take long, and some people fine this sort of work — numbering pages, writing in headings and indexes — a pleasant break. Emerson spent months preparing and then annotating and indexing his notebooks. But, if you'd like the convenience of delegating the work to Tinderbox, is only takes a couple of minutes to add the action. Could we do this with Tinderbox ? Perhaps we won’t be able to automate away the lively tweaking of font sizes, or the clever and subtle choices of color highlights. But this kind of personal dashboard is well within our capabilities; we’ll be looking at some techniques later in the project. Also of interest: Kevin Kelley’s Quantified Self Wiki. In the coming weeks, this column will explore a variety of ways to work with Tinderbox , Eastgate’s tool for making, analyzing, and sharing your notes. We’ll take a look at a series of projects, exploring a variety of rewarding tasks that show various aspects of Tinderbox in an interesting light. This column builds on my book, The Tinderbox Way, emphasizing new Tinderbox features and a different mix of projects. To start the new column in the new year, we’ll look at journals and commonplace books — most generally, Tinderbox files that record things over a span of time. These range from personal diaries to research notebooks, from a naturalist’s field notes to a philosopher’s speculations. Specialized journals can be an invaluable business tool as well, and include not only the salesperson’s invaluable contact diary or the service organization’s complaint log, but also specific records of extraordinary events: project meeting diaries, say, or records of enterprise data outages or of emergency service issues with the company’s troublesome new filtration plant. Knowing what you’ve done, and what you’re going to do, is a key. The first, necessary step, is to write it down: if you don’t record what happened, you won’t be able to analyze and learn from it later. The second step, equally vital, is that you need to analyze and reflect. Simply making a record will help a little, because you’re bound to reflect on the experience as you record it. But you’ll also want to return and examine your record later. And that means you’ll want to explore, to select specifically interesting parts of the record and focus on especially significant facets. You don’t know, as you start your journal, what sorts of analysis you’ll want to do in six weeks, or six years. You may suspect that some facets may be interesting, and so you’ll record those with care. 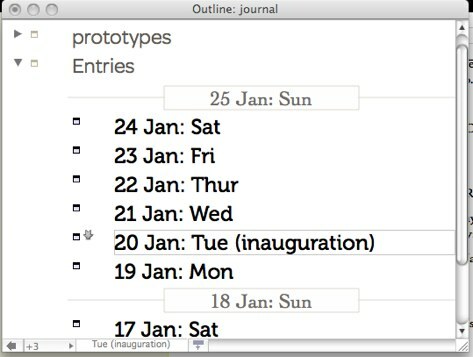 You may speculate that some ways of organizing your journal will be productive and save you time later. Thinking ahead is always good. But it doesn’t matter if you get the initial organization wrong. This is the key to getting started with Tinderbox. Try something: you can always come back later and reorganize. Anticipate as well as you can what you’ll need, but don’t delay the real work by building complex systems. 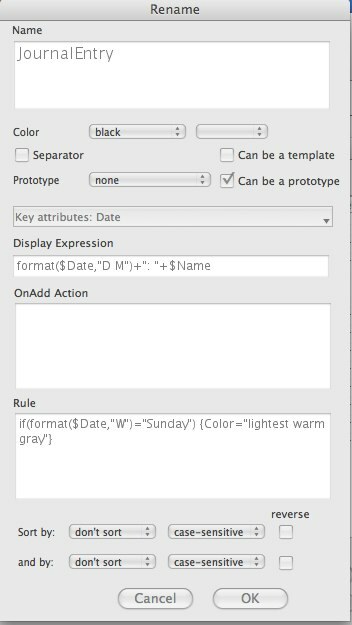 Don’t require yourself to fill out dozens of attributes you may not need; keep it simple (and pleasant), and add complexity as you discover that you need it.